Adventure21 - What do i need to know about raft building? 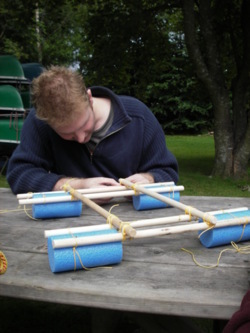 The aim of the raft building activity is to build a raft using planks of wood, barrels and rope lashings, to make a safe, floating platform which will carry your group on a lake or other open expanse of water. The activity includes all specialist equipment including a buoyancy aid, instruction, and waterproof clothing and wetsuits where required. We supply a wetsuit (where required) and jacket but on top wear something warm like a fleece, preferably something old and loose fitting. Footwear should ideally be canoeing type shoes or boots but trainers with grip will do. 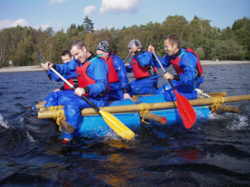 We are available 7 days a week for raft building all year round. You can bring spectators; we would give them a safety talk and advise them of a safe area to view the activity. Once the session is running it is sometimes difficult for spectators to follow the activity as you will be moving around the lake.